A remarkable story of the metamorphosis of a catepillar to a butterfly, The Butterfly Movement is a modern depiction of how the Samaritan woman at the well came to be. It not only digs to the root of her issues, but offers solutions as well. Through her relationship with Christ, she slowly evolves into a woman of noble character. 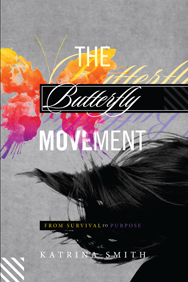 More than a spiritual journey, its a movement that will inspire you to break the chains of generational curses, mental and spiritual strongholds, defy labels and overcome odds that hold you back from transforming into a beautiful, fearfully and wonderfully made butterfly! ABOUT THE AUTHOR: Katrina spreads her love and passion for Christ through ministry, creative writing, as well as advocacy and outreach programs in the community of Indianapolis. She currently works in the non-profit sector helping low income families realize their full potential by helping them remove barriers keeping them from safe, decent and affordable housing opportunities and to put an end to the cycle of generational poverty. She now serves as the founder and Executive Director of Butterfly Ministries, Inc. where the mission is to empower and inspire positive transformation in women and girls.